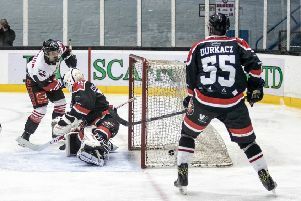 Murrayfield Racers are in pole-position to lift the Scottish National League title following tonight’s thrilling 3-3 tie with Kirkcaldy Kestrels at Murrayfield. Racers, trailing 3-1 with less than ten minutes to play, scored late goals through Joel Gautschi and a first of the season for defenceman Scott Geddes, to grab what seemed an unlikely point and keep their unbeaten streak in all SNL competitions alive. The result, which followed Saturday’s 8-4 win at long-time league leaders Dundee Comets, sees Racers move a point clear at the top of the table, and Geddes said: “Kirkcaldy are a really good team, and after a tough game last night we had to get ourselves up for this, even at 3-1 down the game was never over for us, we just had to dig deep and try to get that point. Kirkcaldy, smarting from a 6-0 Scottish Cup defeat the last time the two sides met, came out playing a fast and physical game, matching Racers stride for stride and it was no real surprise when the visitors took the lead in the sixth minute through Scott Jamieson. If the first period was fast, the second was frantic with fans treated to more end-to-end action, and Kirkcaldy doubled their lead in the 33rd minute, Liam Danskin on hand to supply the finish to a well worked team goal following a face-off win in their own zone. However, Racers were on the board themselves less than two minutes later, Rihards Grigors with a slap-shot after Kestrels goalie David Jackson and then the post hand denied both Aaron Robertson and Ethan Reid. Kirkcaldy weathered some early Racers pressure in the third period, and with 13 minutes left went 3-1 ahead, a mix-up in the Racers defence saw the puck break to Danskin whose slap-shot was tipped beyond Racers net-minder Mark McGill by Jamieson for his second goal of the game. 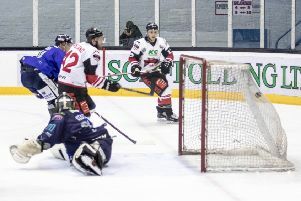 As Racers ramped up the pressure, Kirkcaldy ran into penalty trouble and Gautschi scored on a five-on-three power-play with seven minutes to play. Kestrels managed to kill the remainder of the power-play and went on to rue a Sean Cochrane missed break-away chance when, with four minutes left to play, Geddes struck with a well placed shot from just inside the blue line.